Sculptor Aldo Moroni thinks big. Really big. His latest project sets out to chronicle the development of western civilization. 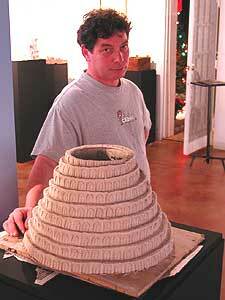 He's building, and rebuilding, the ancient city of Babylon in his northeast Minneapolis studio. He'll take it from ancient times up to its current incarnation in modern day Iraq. Minneapolis, Minn. — The Tower of Babel stands on a small pillar just inside the California Gallery's front door. It's about one foot tall, and made of red clay. Blue green windows spiral up the outside. Across the room, there is a white-walled palace with five baby blue onion domes. The earthenware structures are classic Aldo Moroni work -- whimsically attractive, deceptively simple looking, but laden with the weight of history and culture. When the time is right, Aldo Moroni will move them across the room, to place them on the Babylonian landscape he has built in a large platform. It depicts the area between the Euphrates and the Tigris Rivers in Mesopotamia. There are no buildings there yet. Moroni has it laid out as the Garden of Eden. But that's going to change. Over the next three years Aldo Moroni is going to build Babylon. "I am going to have these little reed huts that will start civilizations," he says. "Those reed huts will become a city, like the city of Ur, one of the first cities. Those reed huts will become the Tower of Babel." When Aldo Moroni starts talking about Babylon, it can take a long time before he runs out of things to say. He talks of how this area was a cradle of civilization, and the home of great kings such as Nebuchadnezzer. It was also considered a great prize by Alexander the Great and Kubla Khan. Moroni says it was where humans first developed some basic concepts. "Like the idea of making a brick. Or the idea of digging a hole to be able get water out of it, or the idea of channelling the water from the river to be able to irrigate your field, or the idea of growing wheat," says Moroni. "There's an argument about whether beer or bread were invented first. But that's another subchapter, because there are many subchapters in this story." Moroni is clearly having a ball. His face, ringed by black curly hair, sports an almost constant grin. He intends to follow the history of the area as it develops through the Ottoman Empire, World Wars I and II, through when Winston Churchill created the country of Iraq on the back of a napkin. "Those little reed huts will become, eventually, the Holiday Inns and the skyscrapers you see on TV as our sons fight in the streets of Baghdad. That's what it's about." Moroni says architecture is a metaphor for humanity, of who we are and what we are -- spiritually and physically. He says it's vital for Americans to see that the current war in Iraq is not a final resolution, but just the latest chapter in an ongoing history. Everything gets tied back to the history in some way. He says his landscape base is made from a mixture of red clay dust, motor oil, grease and petroleum wax. It will never dry out, but will remain malleable, so he can mold it as necessary. "Here's the wierdest thing about it," he says. "We are talking about this place where people are fighting about oil. What's my sculpture made of? Oil!" He cackles in delight. You may be wondering how Moroni is paying for this project. In a novel way. He's selling off six-square-inch plots in Babylon to people he calls "citizen patrons." The patrons pay $600 for each plot. When each phase of the sculpture is done, they get to keep all the structures built on their patch. This led to some strange scenes on opening night, as people competed for the best sections. Some folks discovered they'd been beaten out. "The Bachmans are here!" called one man. "Oh, right on the river! Right on the point!" his wife responded. "I wanted that spot!" Meanders in the river were popular, although some people like arts consultant Sue John had other ideas. "I wanted to be in the center of Babylon, right smack dab in the middle," John said. When asked if she got it, she replied emphatically, "I did!" John is excited about the Babylon concept. "Its about the war. It's about creation. It's about the end of the world. It's about everything. It's about what is happening right now," says John. Working his way through the crowd, gallery co-owner John Kremer is having a good time, too. He jokes the show has made real estate into an art form. He says in a time when foundation support for large projects is getting tighter, this might just be a funding alternative. Kremer's looking forward to seeing how the public reacts to the show. He says there is just something about Aldo Moroni's buildings that draws people in. "They don't make archaeologists happy, they don't make historians happy," Kremer says. "And yet ... I heard more discussions today about Iraq, or the cradle of civilization. I haven't heard so many people say Nebuchadnezzer before in one room. So it really makes things alive for people." Babylon will continue to grow in the California Building in northeast Minneapolis through 2006.